Roel Baets is full professor at Ghent University (UGent) and is associated with IMEC. He received an MSc degree in Electrical Engineering from UGent in 1980 and a second MSc degree from Stanford in 1981. He received a PhD degree from UGent in 1984. From 1984 till 1989 he held a postdoctoral position at IMEC. Since 1989 he has been a professor in the Faculty of Engineering and Architecture of UGent where he founded the Photonics Research Group. From 1990 till 1994 he has also been a part-time professor at Delft University of Technology and from 2004 till 2008 at Eindhoven University of Technology. Roel Baets has mainly worked in the field of integrated photonics. 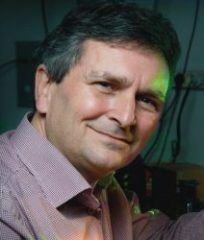 He has made contributions to research on photonic integrated circuits, both in III-V semiconductors and in silicon, as well as their applications in telecom, datacom, sensing and medicine. Web of Science reports over 600 publications with an h-index over 60. As part of a team of 8 professors Roel Baets leads the Photonics Research Group. With about 90 researchers this group is involved in numerous (inter)national research programs and has created four spin-off companies. The silicon photonics activities of the group are part of a joint research initiative with IMEC. Roel Baets has led major research projects in silicon photonics in Europe. In 2006 he founded ePIXfab, the globally first Multi-Project-Wafer service for silicon photonics. Since then ePIXfab has evolved to become the European Silicon Photonics Alliance. Roel Baets is also director of the multidisciplinary Center for Nano- and Biophotonics (NB Photonics) at UGent, founded in 2010. He was co-founder of the European MSc programme in Photonics. Roel Baets is an ERC grantee of the European Research Councile and a Methusalem grantee of the Flemish government. He is a Fellow of the IEEE, of the European Optical Society (EOS) and of the Optical Society (OSA). He is also a member of the Royal Flemish Academy of Belgium for Sciences and the Arts.